Arlevert is a drug that contains two active substances. These substances, cinnarizine and dimenhydrinate (also known as diphenhydramine) both belong to the medical class of antihistamines. Arlevert is prescribed if symptoms of vertigo occur - this include dizziness, spinning sensation and nausea. The symptoms of vertigo are caused by problems in the balance organ that is located in the inner ear. The action of Arlevert blocks the signals from the "nausea center" to the brains and therefore the symptoms reduce. Arlevert can also be prescribed for symptoms of migraine. Use Arlevert according to the advice of your doctor or pharmacist at all times: always read the enclosed leaflet. Arlevert should be taken during or after a meal with water. 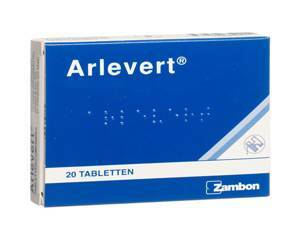 Arlevert tablets contain either 20mg or 40mg active substances. The doctor will determine which dosage you should use. Doctors also recommend not to use Arlevert for longer than 4 consecutive weeks. If you still experience vertigo related symptoms after this period, consult your doctor again. One of the most common side effects of Arlevert is drowsiness. Usually this goes away on its own. If you experience drowsiness, you may have a reduced ability to concentrate and are less alert; therefore it is recommended not to drive a car or operate machinery. Other possible side effects include headache, upset stomach, diarrhea and dry mouth. In addition to the side effects mentioned above, there may also be interactions when it is combined with other medications. Therefore always mention the use of other medications to your doctor, especially antidepressants, medications for high blood pressure and antiarrhythmic drugs (used to treat cardiac arrhythmias). If you need to use another medication in addition to Arlevert, ask for advice from your doctor or pharmacist. In the event unexpected, serious side effects occur, immediately stop using the medication and consult with your doctor. Are younger than 18 years. Are pregnant or breast-feeding (the drug may end up in breast milk and possibly have a detrimental effect on your baby). Are hypersensitive to one or more ingredients of the tablets. Suffer from any of the following conditions: epilepsy, alcohol abuse, increased pressure in the eyes or brains, heart disease, prostate problems, liver or kidney failure.